People move. They move to improve their lives. To move, they use whatever means of transportation available. More than 25,000 years ago, prehistoric animals, like the mastodon, and the people who hunted them crossed the land bridge from Asia to Alaska and south into the rest of North America, and even farther to South America. On pre-historic plains, later called South Dakota, ancestors of present-day Native Americans walked to get where they wanted to go. To find better places to live and hunt, Native Americans had only one transportation option—their feet—until the middle of the 17th century. At that time, Spanish military explorers and missionaries brought with them an animal that would dramatically change life in the Americas. From Spanish missions, Native Americans acquired horses. On horseback, Native Americans could move more quickly and more easily. They could hunt buffaloes across broader ranges, killing more selectively. They could find better places to live, and better ways to fight. 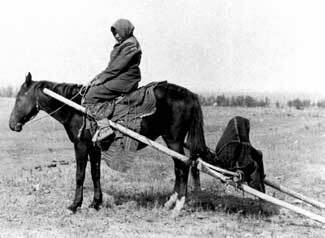 For hundreds of years the horse was the best land transportation technology there was. In 1858, the first non-stop stagecoach trip, from St. Louis to Los Angeles, almost 2600 miles, took 20 days. Two years later, the Pony Express covered 1966 miles, galloping from St. Louis to Sacramento, in 11 days. Horses pulled plows, buggies, barges—everything a human could not. Without this literal horsepower, transportation would have been nearly impossible. Eventually, though, horses were replaced. From 1862 to 1883, railroad companies built the infrastructure for train travel; soon, train tracks and trains crisscrossed North America, bringing thousands of emigrants to once-remote land. It took 19 years for the Northern Pacific Railroad to complete its system. The expansion of rail transportation coincided with the decline of the buffalo: from an estimated 60 million at the beginning of the century, the gigantic herds had been reduced to 2000 animals. 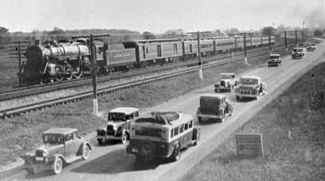 Like horses, trains were replaced by another transportation innovation: the car. As automobiles improved (and became more affordable), so did roads and highways. The U.S. Highway System led to the Eisenhower Interstate System, further opening up the country. People could move around South Dakota and the nation like never before. As cars and the roads spread, one more innovation soon started to have an impact on how people move. In the 1930s commercial air service reached most corners of the United States, including South Dakota. Airline passenger traffic volume, the number of miles people travel by plane, increased by 1700 % from 1954 to 2001. More than ever, people are moving. Whether the transportation is planes, trains or automobiles, horses or on foot, it is a vital aspect of daily life.